After class today, I stopped at the grocery store and saw this while in line to check-out. Oh, O. 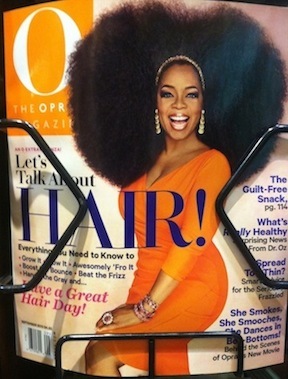 Yes please, Oprah. I would love to talk about hair with you. The day after my fiance shaved my head, Beyonce debuted her pixie cut. I wondered how that was going to change her shows, then thanks to my sister for the trashy magazine subscription, I learned that when the ‘Mrs. Carter Show world tour resumes in England on August 17, Bey will continue to rock her signature flowing hairpieces. That hair whipping around is a big part of the performance.’ I love that the magazine acknowledged that they are ‘signature flowing hairpieces.’ Also, her new ‘do didn’t last long as her pixie mysteriously grew into a bob over night. Specifically, I’d like to comment on the dietary component when it comes to autoimmunity. I myself have battled celiac disease and some unknown auto-antibody elevations from time to time that are accompanied by fatigue and joint pain. I’ve undertaken radical dietary change and have witnessed a dramatic difference in my quality of life. I’ve gravitated to eating an alkaline and anti-inflammatory diet, rich with berries and pigmented foods. I’ve also read about the Body Ecology diet, which promotes eating minimal sugars and also plenty of probiotic rich foods (fermented and raw foods, my favorite being homemade sauerkraut) as a way to promote optimal digestion and assimilation of nutrients! As a physician trained in western medicine, but someone who has also studied natural medicine and healing approaches to most diseases, I’ve researched numerous dietary approaches and combined my medical knowledge with a good dose of intuition and common sense and found that the body really does need a heavy alkaline food intake, adequate hydration, and probiotics to prevent “leaky gut” syndrome which is the underlying source of many autoimmunity diseases (also a condition common in western cultures that rely on dairy and wheat, two things that should only be consumed sparingly, despite what the food pyramid suggests!). Well done to this author! May those of us with autoimmune diseases continue to find what works for us and bear the burden of our conditions for as much equanimity and patience as possible….